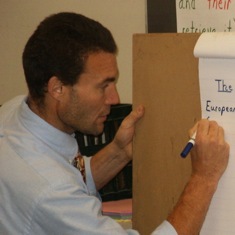 Max Brand describes how word observations can work as powerful minilessons in elementary classrooms. Karen Terlecky details the assessments and preparation that goes into the design of her sentence observation program. 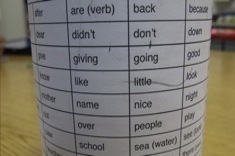 Max Brand developed Spelling Cycles as an alternative to weekly spelling tests. He explains how they work with an example from a third-grade class. 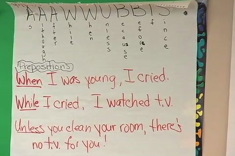 Jennifer Allen collaborates with a new teacher, Jessica, early in the fall to teach a lesson in Jessica’s 4th grade classroom. 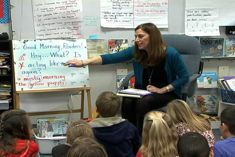 In this brief video from Linda Karamatic’s 2nd grade classroom, students share words they are noticing, and Linda talks about making revisions to the wall displays of words in the classroom. She also mentions the word “wretched” which the class discussed the previous day, and how the word might be used naturally in conversations.